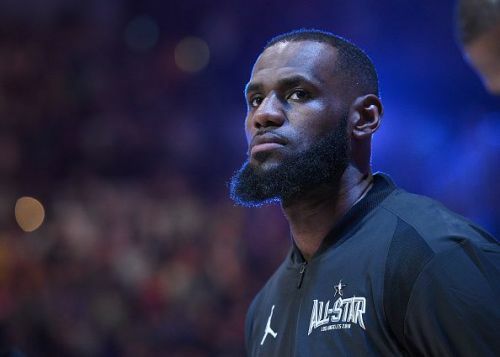 Four-time league MVP LeBron James has informed the Cleveland Cavaliers' organization that he will not be exercising his $35.6 million option for next year. ESPN's Ramona Shelbourne provides a little clarity on this situation. LeBron didn't have to opt out per say, he just had to inform the Cavaliers that he wasn't going to opt-in. ESPN's Ramona Shelbourne confirmed the report. This increases the Los Angeles Lakers chances to land the King and in contrast, hurts the Houston Rockets' already limited chances. Philadelphia 76ers are also still a contender to sign given their huge cap room. ESPN reports had earlier mentioned that LeBron James wanted to make his decision quick (early in July) and his commitment to the Lakers would be assured if they could land Kawhi Leonard through a trade. According to ESPN's Stephen A Smith, who reported this on Thursday, LeBron had called up reigning two-time Finals MVP Kevin Durant asking him to join forces in Los Angeles. Although KD is also set to become a free-agent this offseason, the chances of this happening are highly unlikely. He's living the dream right now, having won two championships in two years, since he left the Oklahoma City Thunder. According to ESPN's Bobby Marks, opting out also helps Cleveland because they can offer LeBron a 5-year $207 million dollar deal while any other team can only him a 4-year max contract worth $152 million. Well, so far it was the waiting game for LeBron to not pick up his option. Now that, this report is out, it's all down to the Lakers and their ability to trade Kawhi Leonard. And whether or not Paul George also joins the franchise as a free-agent. NBA 2018-19: Where do LeBron James, his battered Legacy and the Los Angeles Lakers go from here?